Southern Province Permanent Secretary Mr. Sibanze Simuchoba delivering his speech when he officially launched the of Re-aligning Agriculture and Water Sanitation and Health Hygiene(WASH) for Nutrition(RAGWA-NUT) project yesterday that has been co-funded by The European Union (EU) and World Vision at a total cost of Euros 1.1 Million yesterday. The project would run for 36 months from November 2016 to December 2019. Government says it has abolished sub committees of the Provincial and District Development Coordinating Committee respectively, in an effort to integrate key players in the implementation of the 7th national development plan ( SDNP ). The sub committees have since been replaced with clusters consisting of the fifth developmental outcomes of the SDNP which include economic diversification ,job creation, poverty . Others include the vulnerability reduction, reduced developmental inequalities and an enhanced governance environment for a diversified and inclusive economy. 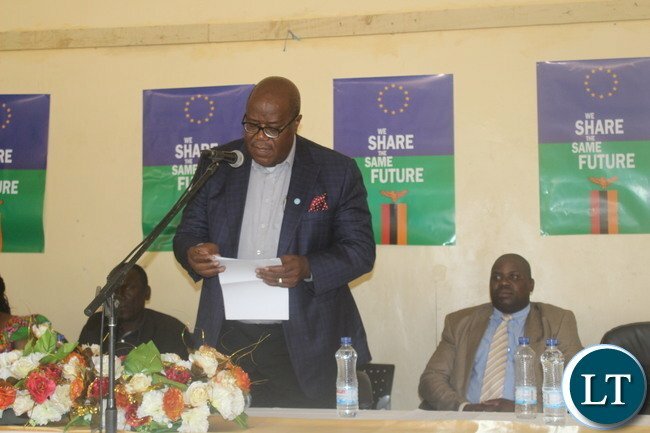 ZANIS reports that this was revealed when southern province permanent secretary Sibanze Simuchoba officially launched the new PDCC and DDCC cluster committees at an extra ordinary provincial development coordinating committee meeting in Choma District , today. The permanent secretary disclosed that the new clusters will have a chairperson and co-chairperson appointed to spearhead the provincial agenda as outlined in the 7th national development plan. “Institutions that will jointly be addressing a particular development outcome will come up with one integrated implementation plan.” Mr. Simochoba said. He said that in a bid to promote decentralization planning, activities will start from ward development committee level, through to district, provincial and national development coordinating committees. The permanent secretary said the provincial administration will act as a link between the national and district levels in providing feedback on programmes and projects. He further disclosed that inter-provincial collaboration will be encouraged for programs that will span across provincial boundaries with a view to build on inter-provincial comparative advantages. And assistant director in the ministry of National Development Planning Kennedy Mubanga said the system of monitoring and evaluating for 7th national development plan will now be output-based in order to enhance performance of the responsible officers and quantify the beneficiaries of development programs. “In the education sector for instance, the kind of reporting we will expect will not only be looking at how many schools were built but instead the number of pupils enrolled in those schools.” Mr Mubanga said.